Every year, “conveniently” timed with tax season, we remember that DQYDJ is ostensibly a personal finance site. Let’s turn tax-frowns upside down with a post on asset allocation here in in April, 2019. Asset allocation is an interesting topic. We like to approach it with a view of all of our liquid – read: non-real-estate – assets. In our recent post on the yield curve we mentioned our target for a 60/40 risky/safe ratio. We talked about it again in our 2018 savings rate post. We*’re anticipating choppier investment waters than the last few years. How did we do after the self-audit? Pretty close! *”we” here equals mid 30s, married, with two kids. To be honest, it’s not all that far off from our allocation last April: 62/38. However, investment gains and savings over the year threw it off – this allocation wasn’t a given. A few months ago risky assets were upwards of 80% of our liquid portfolio. So – 87/13 if you care about the safe stuff, 80/20 if you don’t. The third argument is, of course, the weakest. Knowing it well introduces bias. Additionally, in theory, buying a well constructed index means we don’t need to know a country. For the record, that 20% allocation is us over-weighting Pacific markets and Europe. We’ll watch this, but I’m not as concerned about fixing this bucket as I was in the past. 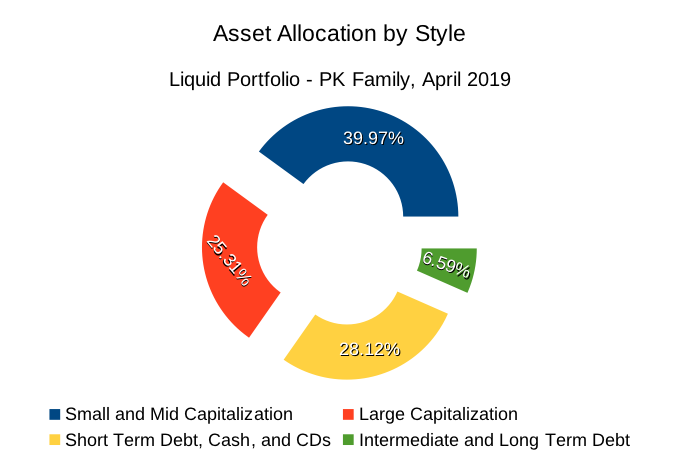 Asset allocation in April 2019. Pie chart to annoy you. We should probably flip our small/mid cap exposure with large cap…. As for the Short vs. Long/Intermediate term disparity? It isn’t really fixable with the yield curve in its current state. Best case, perfectly timed 30 year Treasuries would have yielded 4.85% in April 2010 – buying today gets you under 3% for 30 years. With short term cash yielding over 2% in all our (non-checking) accounts there’s really no need to fix this. Why Bother Messing with Asset Allocations? Setting aside the fact we had roughly the same percentage of safe & risky assets last year, why bother changing it around? Isn’t it market timing to move to only 60% risky assets at our age? Maybe, but how you define this allocation doesn’t phase us. Our goal is to set ourselves up for a minimum of stress in a choppy market. Imagine: starting with a 60/40 breakdown, where safe assets appreciate by 5% in a fall while risky assets fall 50%. That leaves us around 42/58 risky/safe – and only 28% down! 50% isn’t really a random number. That was what the last two bear markets temporarily destroyed in value. I don’t think working out of a 60/40 breakdown for a while is bad. The trick is, of course!, moving back to a riskier allocation when and if we see a real fall. How is your asset allocation post-tax season? Asset allocation is something I’ve been thinking about quite a bit. One of the investment vehicles I have allows me to change to a higher mix of more conservative investments easily. I understand why this is recommended. In Sept 18 I switched this fund to a conservative balance of bonds vs equities. It still lost significant value through December 18. So not only am I taking risk of not keeping up with inflation, it didn’t protect me during a downturn. Not only that but because I left it conservative during the month of January I wasn’t able to take advantage of the rebound. Timing with these sorts of things is always the issue. I’m not smart enough to know when the market will bounce back. My biggest risk seems to be the loss of value from inflation. After reading a comment online from someone else ,that made a lot of sense to me. I’ve decided to keep what I need for emergency funds (6 months of expenses) in cash. 2 years of expenses in growth and income style funds which do have a mix of treasuries, bonds and dividend paying equities. Everything else is in higher risk equities. Fair point, since even if you do get something directionally right you almost never get the magnitude or timing (and if you do, it’s arguably luck). I actually started liquidating in September so I did decently on timing for the original S&P bear… which has now roughly cancelled adjusted for inflation/dividends. With 2%-2.5% on short term cash I’m less concerned about inflation now, though. I figure we can at least match inflation at these rates. I have to say, I’m not a huge fan of shifting my portfolio based on external factors. I tend to set a sigma that I’m comfortable experiencing four of once in a lifetime, and three of on a regular basis (once a decade), and then building my portfolio using a combination of individual companies and indexes to fall along the efficiency frontier based on that. I may change my mind on certain businesses I own a sliver of based on possible future potential, but the allocation to each type of assets doesn’t change much over time. Makes sense – and as you know, I’ve been skittish for a while. Too plugged in for my own good sometimes I’m sure, haha. Best case I get to run around and buy a bunch of things in some sort of a fall.